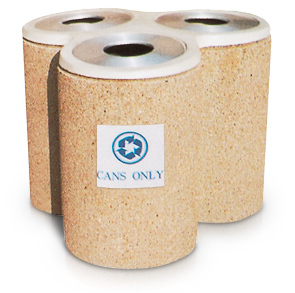 Triple your recycling efforts with the 3-unit clover outdoor recycling containers. Featuring spun aluminum lids with cable attachments and three drain holes at the bottom. Each side is fitted with a 12" Sq. sign that clearly identifies the receptacles as apart of a recycling program. Three Drain Holes at the Bottom. Heavy-Duty steel reinforced concrete is treated with water-repellent sealer to enhance the appearance of the stones, help prevent water, salt or dirt penetration and cracking, and most importantly, extend the life of the aggregate by forming a protective barrier against the elements. Rigid plastic 22 gallon round liner measures 14-1/2" Dia. x 30"H and is sold separately. 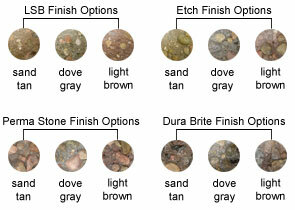 This concrete recycling container is available in Light Sand Blast, Etch, Perma Stone, and Dura Brite finish options. Manufactured from high quality aggregates to ensure all requirements are met according to ASTM standards.